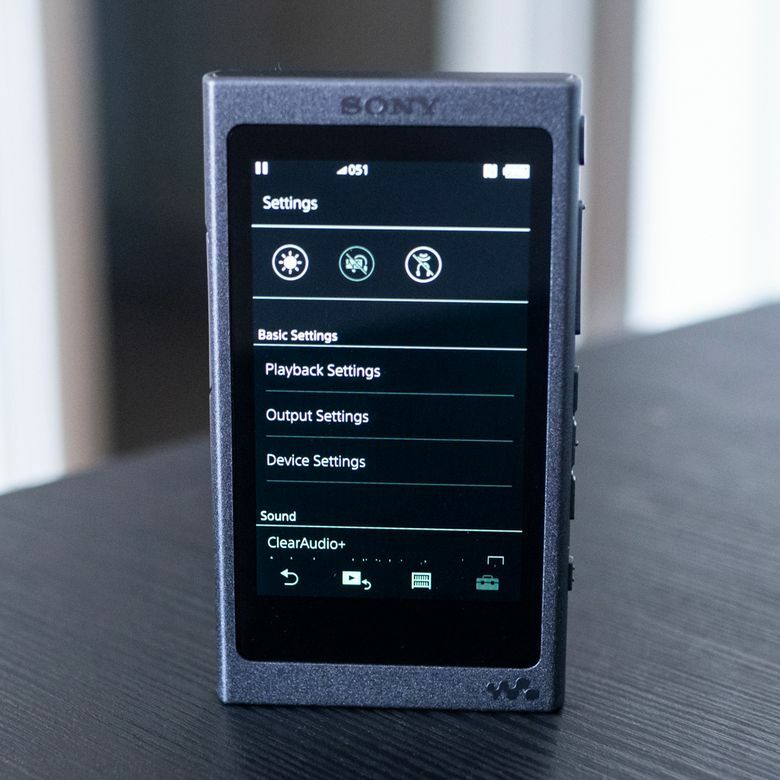 If you’re in the market for a premium lossless media player, but don’t want to spend exorbitant amounts, the Sony NW-A-35 is one of your best bets with solid playback and good compatibility. In a world ruled by Spotify and Apple Music, you may be surprised that there’s still a market for media players like the Sony NW-A35. While the A-series units from Sony are labeled as “MP3 players,” it’s not really fair to classify them that way, as they give you far more options for media file playback. And that makes a lot of sense, because the central use case for an audio player at this price point is to offer better sound digital file playback. Most people will stream music on their phones, and that will work for the average listener, but the Sony A35 offers a feature set designed to not only play higher definition music files, but to also amp up the quality of MP3 files. Through both software compatibility and some choice hardware inclusions, Sony has a fascinating option here, for a decidedly niche audience. The device itself measures at 4.75 x 2 inches looking at the front, and it measures less than half an inch thick. This puts it much smaller than a phone, but notably larger than many of the other media players on the market. This is mostly okay, because if you’re used to a phone, then this will fit in well, but it isn’t going to be an iPod Shuffle or anything like that. The exterior is a brushed aluminum texture, which gives it a premium look at first glance. The model we tested is what Sony calls Black, but due to the brushed matte finish, it’s really more of a dark gray or charcoal. You can also choose from blue, red, yellow and pink. This is reminiscent of the color selection you’ll find on older iPod Nanos, and it’s nice to see options. The crisp, responsive touchscreen controls definitely make the device feel premium even if it doesn’t go overkill with a quad HD or 4K display. All of the physical buttons sit on the right side of the device, while the ports sit on the bottom, and the microSD slot is on the left. It sports an 800x480 pixel resolution in a TFT panel. This actually looks remarkably good compared to many of the cheaper MP3 options out there, and it’s surprising how well Sony has made the screen look with the spec limitations. The crisp, responsive touchscreen controls definitely make the device feel premium even if it doesn’t go overkill with a quad HD or 4K display. The NW A-35 supports the standard lossy, compressed files such as MP3, WMA and even FLAC. The latter is important because it includes more than double the sampling frequencies of MP3, meaning even though it isn’t a raw, uncompressed file, it comes much closer to representing all the audio information of an uncompressed file. You’ll also get support for Linear PCM WAV files, Apple’s allegedly lossless m4as, and of course AIFFs. This mean no matter what format your music collection is in, you’ll most likely be covered with this player, and more importantly, you’ll have a much richer listening experience than streaming. At the core of the Sony’s playback here is the high-resolution S-Master HX digital amp, which aims to cut distortion and noise across the spectrum. This is the key difference between a dedicated player like this because it offers a much more holistic DAC solution than you’ll find on many smartphones, flagship or otherwise. But what’s possibly more important here is the fleet of software integrations involved, including the SEE HX sound enhancement engine that tries to bring even your lossy files up to a higher quality and the DSD Pulse Code Modulation playback. In our testing, this amounted to really powerful playback of the lossless AIFF and WAV files. These bells and whistles were less pronounced with MP3s, which is to be expected, but across the spectrum, this device does have the capability to give you solid, full-range playback. Sony advertises the battery life at up to 25 hours when running the DSD functionality, up to 30 hours when you ask the player to handle FLAC files, and up to 45 hours playing back MP3 files. In our tests, we trended at about 35 hours of playback, mixing up file types and playback algorithms. At a certain point, battery life becomes respective to what your expectations are. In our minds, having over a day of non-stop playback means that you’ll be able to run the media player on a single charge for several days — unless of course, you are actually listening to it nonstop, 24 hours a day. In our tests, we trended at about 35 hours of playback, mixing up file types and playback algorithms. The included USB 2.0 connector charges up the device in about 3-4 hours, which means that as long as you plug it in each night, you’ll likely never run across a time when it dies in a single day. The NW-A35 has 16GB of onboard storage, and we found that that was a lot of room only if you opt for FLAC or MP3 files, and space understandably filled up quickly when we started using lossless, uncompressed files. But, there’s a microSD card that we found really handy, especially when it came to swapping out libraries of music on the fly, without the need to transfer files. With a build that is largely brushed aluminum, the device does feel premium, and that goes a long way toward justifying the price point. And at only 3.46oz, the aluminum build does a lot toward making this a sleek, lightweight device that won’t weigh your gym or travel bag down. Sony has also given some solid-feeling buttons and rockers, that have a pretty satisfying click to them. However, anecdotally, in our experience, the device felt a little flimsy, and we were constantly concerned we were going to break the screen, scuff the edges, or otherwise cosmetically damage the device. Thankfully, we didn’t drop it, and that is perhaps owed to the texture on the back, but we recommend trying to find a case, screen protector, or even a sleeve to put it in. With a touchscreen device that isn’t a smartphone, our expectations were pretty low, as we were expecting a laggy control setup and difficult-to-navigate menus. That was not the case—Sony put in a lot of effort to make sure it felt modern. Upon booting up the device, there is essentially one screen that lets you look at and parse your music library by a lot of different variables including artist, album, song, playlist and even file type. What’s interesting is no matter what list you do call up, you’ll see a note on the far right side of the screen alongside each track that indicates what that file type is (denoted by color-coded text). That makes it really easy to be clear what type of file you’re listening to. There’s also some algorithmic playlist curation that Sony calls SenseMe channels, but we found that it didn’t work very well without a large library of music. The other side of the UX coin is the method with which you transfer files to the device. If you look at iPods and iPhones, you have to download and use iTunes to transfer music files, and that often leads to difficult-to-navigate lists, especially when it comes to DRM files. The Sony NW-A35 circumvents this issue by simple virtue of the fact that computers read it as a mass storage device. Think of it like a flash drive or external hard drive, so all you’ll need to do is drag your lists of files onto the device. You’ll need to make sure the files are compatible with the device—which counts out video files—and we also had some slight issues parsing out files based on their metadata. We recommend titling the files just by their song name and making sure the files’ metadata on each is correct. If you have a ton of different file naming schemes, the player won’t know where to put them. With an MSRP around $219.99 and typical retail that runs even higher than that, the Sony NW-A35 is a premium device. Though it’s important to keep it in perspective — Sony also offers an ultra-premium player with all the bells and whistles that will run you into the thousands of dollars. But, on the lower end, you can find MP3 players from budget brands as low as $20 or so. What you’re getting with this price is a premium menu structure, and a host of audio features, including support for most lossless audio types. The price feels a little high to us, but it could be a good option for audiophiles. The m3K provides you with solid performance from the built-in DAC, and at only around $70, you’ll save some money. The UX and build quality do seem a bit lacking compared to the A35. At $20 or $30, the AGPTEK options are much more budget-oriented, and we found the build quality on these lower models to be slightly superior to the Sony. But they don’t support as many file types and don’t offer as many algorithmic playback solutions as Sony. At this price, you’re probably only buying the A35 if you’re in the market for a well-rounded audio player to listen to your large existing library of lossless files. If you’re looking for something that’s just meant to be a gym listening device, you can save a lot elsewhere. But for playback quality and file type support, this is a pretty good deal, even if it is an investment. Product Dimensions 2.2 x 2.83 x 0.43 in.